IITC Life Science Grip Strength Test for rat and mouse is used to to assess muscle hyperalgesia. The IITC Life Science instrument measures the forelimb grip force using a digital force transducer. 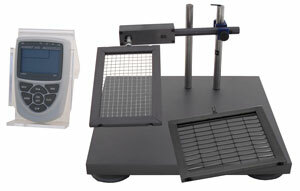 The transducer in the Grip Strength Meter is connected to a wire mesh grid connected to an anodized base plate. The animal is held by its tail and is gently passed over the mesh until it grasps the grid with its front paws. Three grip force measures are made and the average of these readings represents the animal’s forelimb grip force at that particular time. The last maximum force is held in a “peak & hold” type readout until reset. The unit gives readings in one gram increments. The IITC Animal Grip Strength Meter is supplied standard with mesh and T-bar grips for mice and rats. The mesh and T-bars are easily exchanged. Maximum force range is 2000 Gr (10% over range allowed). Higher ranges available on special order. The heavy base plate has suction feet to resist even large pulling forces. Both battery and line adapter operation is possible.